Baoshen Temple with the famous 9 Clay Wall-Sculptures of Arhats (the master pieces represent the highest achievements of the ancient sculptures arts in China), The Tomb of Tang Dynasty Poet Lu Guimong with Fare Breeze Pavilion and two of his hand planted ginkgo trees, Wansheng Rice Shop, Ye Shengtao’s Memorial Hall (Ye Shengtao is one of the most famous writer and educator in modern China), Wang Tao’s Memorial Hall (Wang Tao is a famous thinker around 100 years ago), Family Shao’s House, Family Shen’s House (Water Town Cloth Museum), Water Town Farm Implements Museum, Cultural Park of the Southern Yangtze River. Yans Garden, Hongyin Mountain Villa, Ancient Pine Garden, Bangyan Residence. * Explore the picturesque narrow canals, little streets with cobbled street stone or slates, bridges arching over canals and visit the ancient houses, charming gardens in these two towns. Enjoy this completely different world from the hustle and bustle of Shanghai. * Indulging yourself in the picturesque scenery of the bridges and rivers with green trees, ancient simple but graceful buildings. Appreciate the peaceful atmosphere there and feel the magic power of water. Having a tour to ancient towns and villages in China would be a very special experience for who wanna escaping from the over-noising city and long for a vacation that can free oneself in peace. 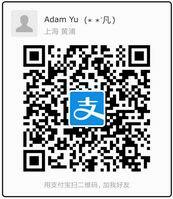 China Ancient Town Tours here selects well-arranged tour packages to famous water towns and ancient villages, aims to provide you opportunities to explore those towns, which well keep their unique customs and culture. You can visit the famous water towns to appreciate their peaceful atmosphere there and feel the magic power of water. 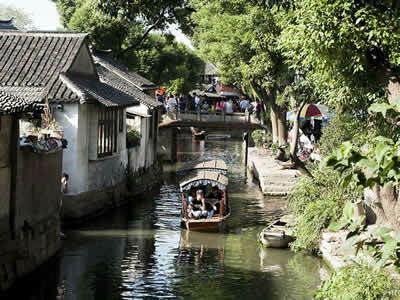 Tourists can enjoy two of the most charming southern China water towns in this itinerary – Luzhi and Mudu. 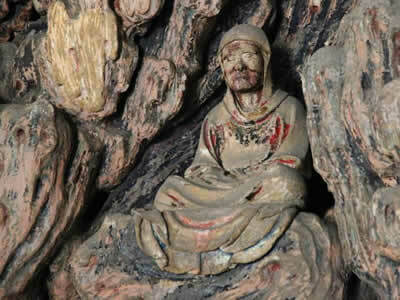 Luzhi is renowned for its ancient relics such as the Baosheng Temple, built in 503 AD, is home to nine well preserved Buddhist clay sculptures made in Tang Dynasty, some 1000 years ago, and numerous bridges. The one square kilometer (0.38 square miles) town proper once had 72 stone arched bridges built in Song Dynasty（960-1279 AD）, Yuan Dynasty（1206-1368 AD）, Ming (1368-1644 AD) and Qing Dynasty (1644-1911 AD). 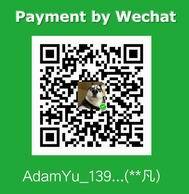 Mudu is famous as the Ancient Town of Gardens in China. Luzhi, another famous ancient water town which is 1.04 s.km large and only 14km to the north of Jinxi, and around 75km / 1h15m drive to the west of Shanghai, is not only famous for abundant water, bridges, lanes, historic houses, and celebrities, but also well-known for its 9 Clay Wall-Sculptures of Arhats and the clothing of women in the water town. 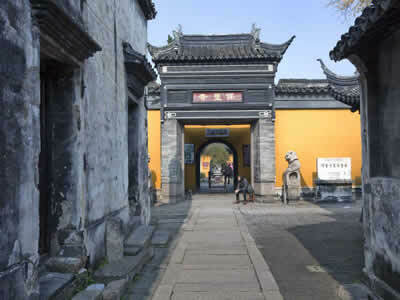 Luzhi, generally viewed as the peer of the ancient Suzhou City, is rare for its distinct history of 2,500 years in the entire southern Yangtze River. It was originated in the Spring and Autumn Annals, stretched during the Han Dynasty, flourished in the Wei and Jin Dynasty (229-581 AD), and bloomed in the Ming and Qing Dynasties (1368-1911 AD). Luzhi accumulated water to form the town, where the water was silhouetted against bridges, 41 of which are still reserved along the river way of 5.6 kilometers. The size, form, and various styles of the bridges have been developed as "the town of water and the center of bridges", and thus called as "the museum of ancient Chinese bridges" by the famous bridge expert, Yisheng Mao. The ancient town consists of 10 main streets, 69 ancient lanes, and a large number of well-preserved houses and buildings built in Ming and Qing Dynasties (1368-1911 AD). Among those houses, the wealthy merchants’ mansions such as Family Xiao’s House, Family Shen’s House, demonstrate delicate building styles and elaborate carvings. As the day draws to an end, tourist will drive back to Shanghai, It is around 2 hours on the way. Located to the southwest of the Suzhou City and surrounded by quiet, delicate landscape and connected to the Taihu Lake (the 2nd biggest freshwater lake in China) through lots of waterways, wins a good reputation of superb grace and elegance. 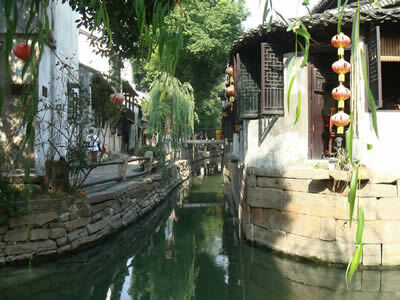 Two clear and charming rivers, Xiangxi River and Xujiang River, wind their ways through the peaceful and beautiful town. With breathtaking scenery and abundant natural resources, circled by a number of mountains, such as Tianping, Lingyan, Qizi and Lion mountains, hence the name "Treasure Bowl". With an area of about 10,000 sq m, the Yans Garden is well designed and meticulously constructed. All the structures in the garden are delicate, exquisite, secluded, graceful and restrained, displaying the designers unusual ingenuity in garden construction. Professor Liu Dunzhen, a renowned architect, named it the "masterpiece in the gardens in the Yangtze River Delta". A famous private garden built during the Qianlong reign (1736-1795) of the Qing Dynasty (1644-1911 AD), the Hongyin Mountain Villa covers a wide area and boasts gorgeous buildings. Its beautiful landscapes of streams, ponds, pavilions, flowers and trees are much better as compared with those in other gardens. It is once the temporary dwelling for Emperor Qianlong in Qing Dynasty. Now it treasures up to 20 original imperial edicts of Qing Dynasty (1644-1911 AD), which are especially rare. This garden used to be the residence of Cai Shaoyu, a wealthy man of Mudu in the late Qing Dynasty. A building in the garden is beautiful and meticulously carved, which matches the Carved Building in Dongshan Mountain in Dongting. Legend has it that they were built by the same artist, hence the name the South-North Sisters Carved Buildings. It is the former residence of Feng Guifen, a famous political essayist of the Qing Dynasty (1644-1911 AD). The house holds three treasures of South China: a woodcarving (an upside down flower basket); a gateway arch built with carved bricks; and a stone carving All Lives Begin to Waken and Grow in the Times of Prosperity.